In my last post, I shared with you some of my experience with dress shopping, and I mentioned that choosing my dress was a bit unexpected. I managed to have some second thoughts shortly thereafter. I was wondering if I made the right choice because I made the decision so unexpectedly and felt a little pressured by a limited-time sale to make the decision on the spot. I spent much of the weekend and all of Monday second guessing myself, and I was feeling really confused and upset. I didn’t want to be THAT girl who picked the wrong dress, but I also didn’t want to be THAT girl who kept looking after making the choice. I have Tuesdays off at my internship, and my mom called the bridal salon before I woke up to see if they had placed the order for the dress yet. As of Tuesday morning, they had not, and she (wisely) asked if they could hold off so that we could just be sure. The staff was completely understanding and extremely helpful. They made it clear that all they wanted was for me to be happy with my dress, so I could try on as many as I wanted to feel comfortable. Of course, it’s important to remember that we had already placed a 50% deposit. Those are not refundable. This particular salon was willing to transfer the deposit to another dress if necessary because the order had not yet been placed. That may not be the case everywhere, and we happened to get lucky that they hadn’t yet ordered the dress. I emphasize this because I would hate for anyone to read this and assume it’s easy to change your mind once you sign off on your dress. I don’t think that’s really the case, but a lot of things happened to line up in my favor! After trying them on, I found one other that I really liked. I’m pretty sure I’ve seen it on Say Yes to the Dress about 50 times, and I can see why so many women choose it now. But then the consultant had me try on “my” dress one more time and BAM. That was it. She left me in it in the dressing room alone for a few minutes as she ran off to get something, and as I was standing there alone, no distractions, I was reminded that it is perfect for me. The way the skirt falls is positively dreamy, and I couldn’t stop running my hands along the fabric. I love it. It is me, and no other dress would be what that one is… for me. The consultant brought me back out and my mom knew too. We jacked me up a bit, made a couple changes to some of the accessory details, and now it is perfect. If you’re in the Las Vegas area and looking for a dress, I found mine at Bowties Bridal Boutique, and Lauren was my consultant. She is wonderful, and I recommend asking for her if you try there! If you are starting the search for a wedding dress, looking online is really helpful. But beware! Not every salon carries every designer. I had originally chosen a favorite online, only to find that it’s not sold anywhere in my city… the designer just doesn’t sell here. The closest place I could have found it was San Diego… which is a bit of a trek and an unnecessary expense. So be a bit cautious! I would suggest doing your preliminary searches to get ideas, but then to narrow when you’re becoming more serious about your decision. Look at the websites for the salons in your area to see which designers and styles they carry ahead of time so that you can tailor your search accordingly! I am in the process of attempting to plan my wedding to my fantastic fiance. I have trouble deciding what to have for lunch most days, so I am pretty much terrified at the prospect of planning such a huge event! At this point, I am in the beginning stages of planning. I am hoping that chronicling my journey here will help me organize my thoughts and maybe help someone else who feels as overwhelmed as I do, and I welcome any (positive and constructive) suggestions you may have! Last week, I made a few forward steps to get started! 1. I went to Barnes and Noble and picked up these to help myself get motivated and organized! I picked this organizer because it has an actual 3-ring binder as well as a 3-hole punch inside, and I thought that could help me keep organized more easily. However, after looking more closely at the content, it doesn’t seem as helpful. I’m considering exchanging it for one that is better suited to my wedding style and budget. Choose a venue that has a vibe with which you connect. Look into the details, too, not just the overall look of the venue. For example, this particular venue’s banquet rooms are names for Founding Fathers and other famous historical figures from the American Revolution, which I think is cool because it ties into our Washington, D.C. proposal! 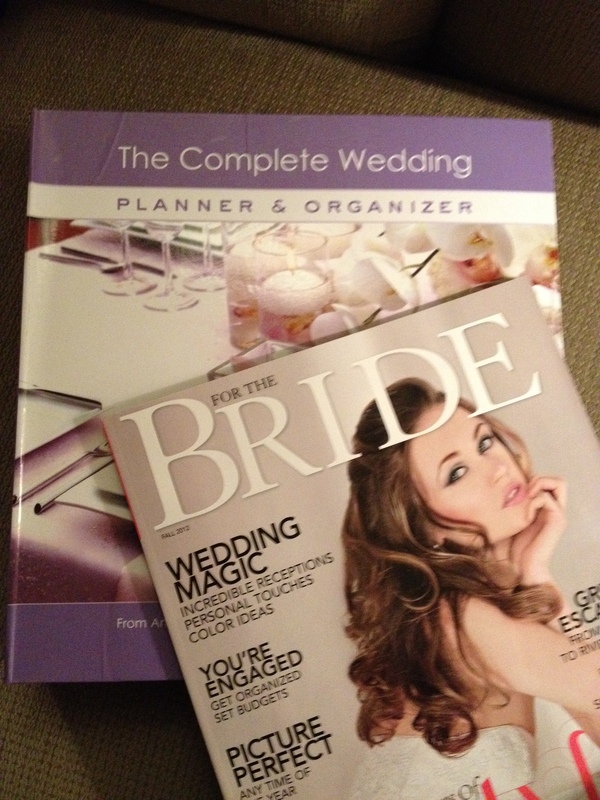 Make sure the wedding/event coordinator goes through the package information and pricing with you. Find out where you can cut corners, what options can be customized, and what can be changed. For example, if the package includes an open/hosted bar for the entire reception, but you only want to have it for the cocktail hour, find out if the venue can accomodate this preference and what change it will make with the package price. Ask about extra fees, taxes, and gratuity! Take a look at the bridal changing area and see if you like it. Check out the ceremony site, if there is one, even if you aren’t really planning to use it. You never know what you might find! Choose a wedding coordinator who “gets” you! If he or she doesn’t like the same ideas you do, it’s going to make things much more stressful and difficult. If you LOVE every idea that he or she suggests or tells you they’ve done in the past, you’ve got a winner! I’m sure I’ll have more to add to this list as time goes on, but these are a few things that I noticed during the appointment and thought would be important! 3. I chose my dress!!!!!! Sorry for all the exclamation points… but not really 🙂 My mom and I really went just to look at a bridal salon that a family friend recommended to see if we would be interested in scheduling an appointment. But, it turned out that they weren’t that busy, so they had me try a couple things on. The first dress was pretty, but just not quite my style. But the second one… It’s perfect! Obviously I can’t post a photo just yet, but I am so excited to have found a dress that I love and by such happy accident! I cried, my mom cried, even the consultant cried! I was a little reluctant to say “yes” right away, but once they had me completely try it on (it wasn’t actually available in-store in my size, so it took a little consultant magic) and they reminded me that it was on sale for nearly half off, I just couldn’t pass it up! Let’s just say that the dress incorporates some of my favorite things in the world, and I can’t wait for MY dress to come in so I can try it on over winter break! Okay, well, I think that just about covers it for now! I hope that you have enjoyed this first installment, and please let me know if you have and questions, comments, or suggestions!